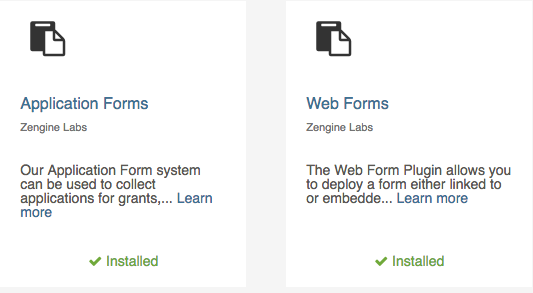 Plugins allow you to extend your Zengine experience by adding new screens (full-screen plugins) or functionality to existing screens (inline and record overlay plugins) within Zengine. 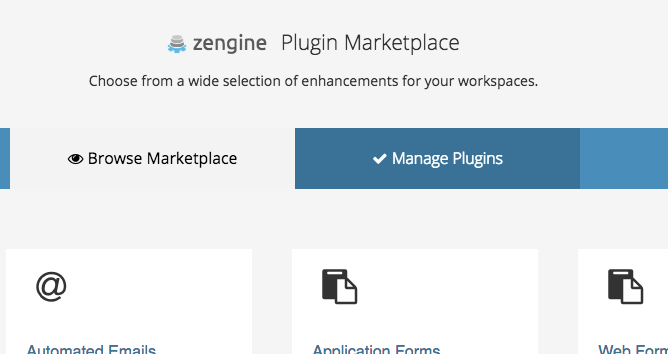 You can browse our public marketplace to find plugins relevant to your Zengine use case. Our private plugin system allows you to build out your own custom plugins. Work with your own technical resources, or we can hook you up with a developer partner. From within any workspace, click on the Marketplace button in the top right corner. This will take you to the public plugin marketplace for that workspace. 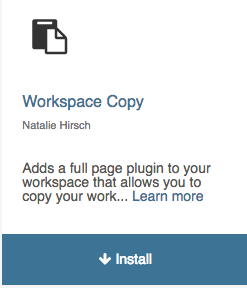 Anyone can browse the marketplace, but only workspace administrators may install a plugin into a workspace. Once you are within the marketplace, you can browse the available plugins. If a plugin is already installed, you will see an installed indicator. If you wish to install a plugin, click on the blue Install button beneath that plugin on the listing page. That will install within your workspace. Once you return to your workspace, the plugin will be activated. You may need to configure settings before your plugin is fully functional. Learn more about individual plugins here and about private plugins here.